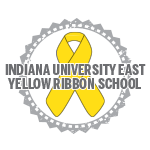 IU East is a Yellow Ribbon Institution. The Yellow Ribbon program under the Post 9/11 GI Bill provides additional financial assistance to nonresident or graduate students whose costs are not fully covered by the Post 9/11 GI Bill. To qualify, you must be eligible for the Post 9/11 GI Bill at the 100% tier and be charged non-resident tuition rates. The Yellow Ribbon Program factsheet and application are below. A provision of the Post-9/11 GI Bill, the Yellow Ribbon Program specifies that degree-granting colleges and universities in the United States may voluntarily fund up to 50 percent of their Veteran students' tuition and fees that exceed the highest rate at a public, in-state school. In return, Veterans Affairs will match the contribution dollar for dollar, providing the remaining funds needed to cover the difference. In participating in the Yellow Ribbon Program, the university has agreed to contribute up to $1500 per academic year ($750 per semester) for each veteran enrolled as an adult degree completion student, and $1500 per academic year ($750 per semester) per veteran enrolled as a traditional undergraduate student in our College of Undergraduate Studies. There is a limit of 10 students total, between adult degree completion and traditional undergraduate students, who may receive this benefit in any given academic year. With Veterans Affairs matching in full, this means that qualifying students could receive between $5,000 and $10,000 each year toward financing their education. Learn about the other VA Benefits available at IU East.